Permeability of a fluid through a saturated material is determined by measuring the dynamic response of that saturated material to shaking vibrations and/or shear wave propagation, and then mapping the dynamic response (preferably, viscoelastic stiffness and damping properties) to an invented model (called "KVMB") that yields the property of permeability. The preferred embodiments may use shear waves, inertial effects, and/or transmission effects, but preferably not compression, to force fluids through the pores. The mapping preferably predicts two possible mappings to permeability, coupled and uncoupled. The preferred methods are both internally consistent and directly related to known laws of physics rather than dependent on empirical calibrations. 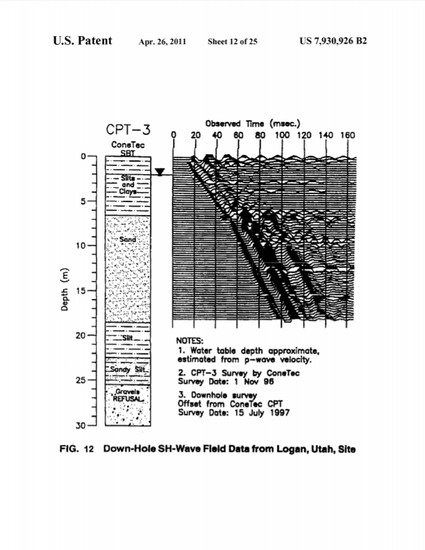 In use, for example, one may use a porosity log (conventional neutron or sonic) and recordings of SH -waves to obtain damping ratio, followed by locating of the damping ratio on a KVMB map that depends on porosity, and choosing of one of the two possible permeabilities indicated by the mapping, wherein the best choice is typically the largely coupled case.